Do you ever look at animals (other than the human kind, I mean) and wish you could live your life as much "in the moment" as they appear? This young gelding is not worrying about what trials tomorrow may bring, or brooding over past regrets. 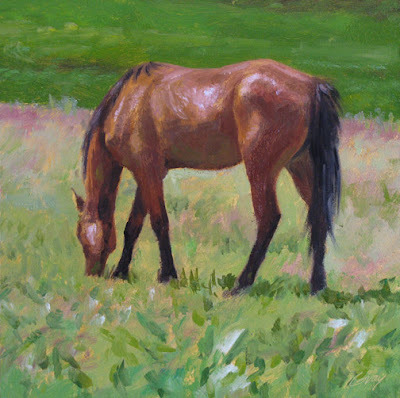 He could not be more at ease, contentedly grazing on a warm summer day. he's beautiful... and living in the moment is something which keeps me in the paint and when i get derailed with fears and what could/would/might/will happen i lose it...r.
It looks as if that beautiful Horse is peacefully enjoying himself. All the best. Nice! This looks like the work of someone who really knows horses; you made it look easy. Thanks, Erika. You made me think of the Gary Larson cartoon, where the cows are standing on two legs until a car comes down the road and they suddenly drop to all-fours. It's true, Rahina--creative work helps keep us in the moment; what a gift that is. Thanks for your note. Thanks, John. Great to discover your fine work.